Possible USDA 100% FINANCING! Want to live beside a little bit of local lore? The old Swamp Rabbit Railroad possibly passed behind this property and It could possibly be added to the expansion of the Swamp Rabbit Trail in the future! 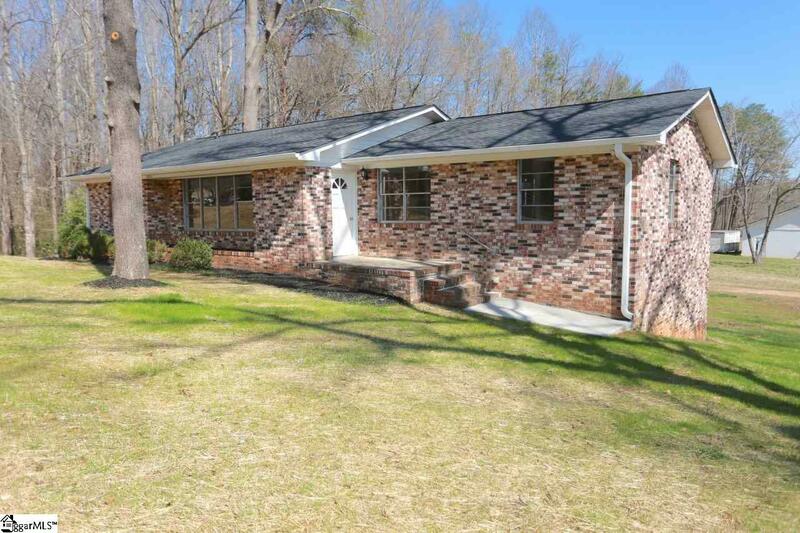 Solid brick RANCH on a BASEMENT has been UPDATED with NEW ELECTRICAL and UPDATED LIGHTING, NEW HARDWOOD FLOORS in the 3 bedrooms, NEW Luxury Vinyl Plank flooring in main OPEN LIVING/DINING (great room), kitchen, & breakfast room. The large windows in both living and kitchen areas flood the main floor with MARVELOUS NATURAL LIGHT. Brand NEW easy-care HD laminate counter tops rest upon freshly updated WHITE CABINETRY. STAINLESS STEEL range and hood to be installed before closing. Look out over the lovely landscape & the old railroad trail from the kitchen and breakfast room. ORIGINAL now popular again retro style ceramic tile floors and walls in both upstairs bathrooms. Master has it&apos;s own full bath with a built in vanity between the bath and closet. Split bedroom plan allows privacy and the heated space in the basement along with a half bath & walkout door hold many possibilities for the next owner. What would YOU do with the space - 4th bedroom, craft room, add a shower and efficiency kitchen for an "income suite"...? FRESH PAINT throughout and super clean makes it an easy MOVE-IN. Take a short walk down the street to find Greenville County Parks and Recreation Slater-White park with athletic fields, walk a bit further to find the Jimi Turner baseball field. You&apos;re only a 5 minute drive to downtown Travelers Rest and another 10-15 minutes to Paris Mountain State Park or Downtown Greenville. Head the other direction from your new home in Slater-Marietta & you&apos;ll find you&apos;re only a hop away from Pleasant Ridge Park, the Mountain Bridge Wilderness Area, and Jones Gap State Park. All this and NO HOA & almost a half acre, PLUS a NEW ROOF & GUTTERS, and HVAC furnace only a couple of years old! Make an appointment to see it today.